Lilo & Kurt. 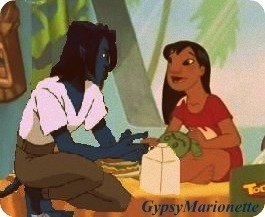 Disney's Lilo and Kurt Wagner (Nightcrawler) from X Men Evolution. Wallpaper and background images in the Crossover Disney club tagged: disney crossover lilo kurt nightcrawler lilo & stitch x men gypsymarionette. This Crossover Disney photo might contain segno, manifesto, testo, lavagna, and poster.